Use as a horizontal or vertical membrane above or below ground. Supplied ready to use for cold application. A) Having laid base screed, apply 2 coats of Aqueous Bitumen, (4-6 hrs between coats). B) Floor, walls etc to be built directly onto the Aqueous Bitumen. 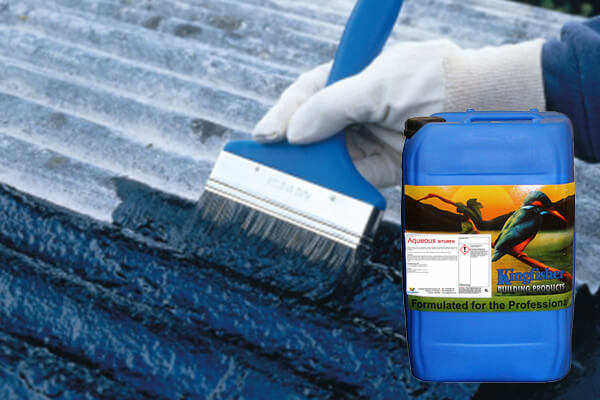 C) Once walls are constructed, 2 coats Aqueous Bitumen should be applied to at least 175 mm above ground. D) To protect the surface during back fill, apply a 3:1 sand cement render. (Use Kingfisher K-X11 gauging liquid). E) A final coat of 4:1 sand: cement for further protection. F) Carefully back fill to desired finished ground level.